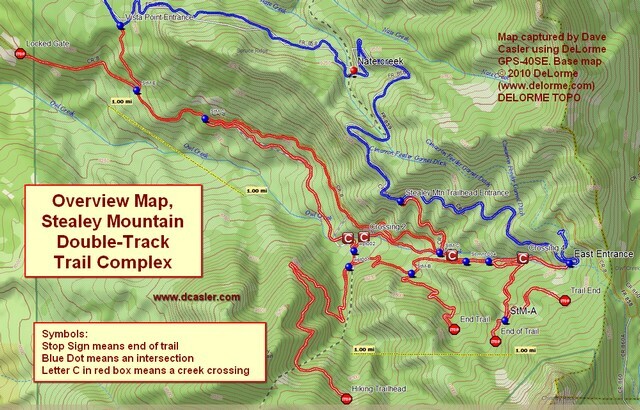 Stealey Mtn Trail Complex: At last a good map! I’ve tried in the past to create a good GPS map of all the doubletrack trails in the Stealey Mountain Trailhead trail complex, but ran into issues with the GPS being fooled by the reflections from the canyon walls. This time, with the new mount in place, I tried again, riding every trail in the complex. While there are still some “out and back” disagreements, the overall map is good enough to call it done. Here’s the east end of the Stealey Mtn Trailhead trail complex. I carefully marked the creek crossings and the intersections. The blue line is Owl Creek Pass Road. Note the 1-mile-long scale line. The stop signs mark the ends of various trails. The southernmost one is a trailhead for a hiking trail. There are three ways to access the trail complex, all shown in the overview map below. In the center, the Stealey Mtn Trailhead has a parking area. To the west, the trails can be reached by the sign for Vista Point. The eastern end is not marked—you really have to be looking for it! All three access points are on Owl Creek Pass Road, Ouray County Road 8 / Forest Service Road 858. The trails in the complex range from absurdly easy to steep and rocky. The creek crossings have steep approaches and require a little planning. You may find closed gates as you travel, be sure to close these gates behind you. There are loose cattle roaming about: be very careful around cattle—they don’t like loud noises or sudden movements. If you wait or move slowly, they’ll get out of the way. The trail complex is one of my favorite places for fall color, abounding in golden aspen. Here’s the entire trail complex available from the Stealey Mountain Trailhead. The stop sign at the very west end marks a locked gate. This entry was posted in Motorcycling, Ouray County and tagged Ouray CR 8, Owl Creek Pass ATV trails, Stealey Mountain Trailhead. Bookmark the permalink. 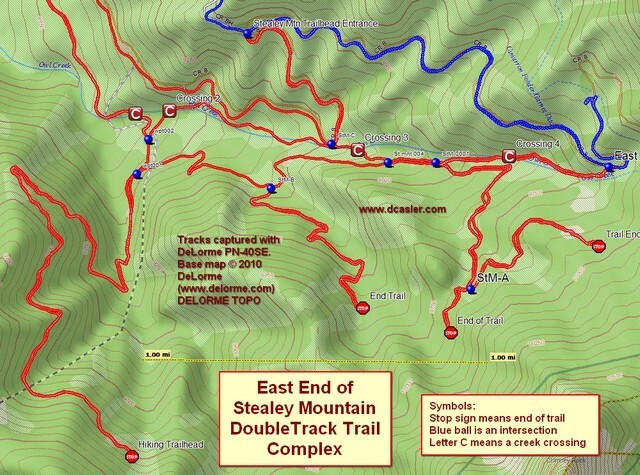 2 Responses to Stealey Mtn Trail Complex: At last a good map! Derrick, I’m not a hunter, so can’t speak definitively. I’ve seen hunters in the area. There is primitive camping available in the area, both near Vista Point and at Stealey Mountain Trailhead. I suggest you contact someone familiar with the hunting in the area, or contact the Forest Service directly. Sorry I can’t be more helpful. Hi My name is Derrick Rann and I love to come to Colorado and Bow hunt and ride my ATV do you think the stealey Mountain trail would be a good place to ride and do some Elk hunting ? And if so is there a good place to do some campaign close to the trail? And how many miles can you ride on the trails and is the trails very crowded with riders? Thanks for your help.